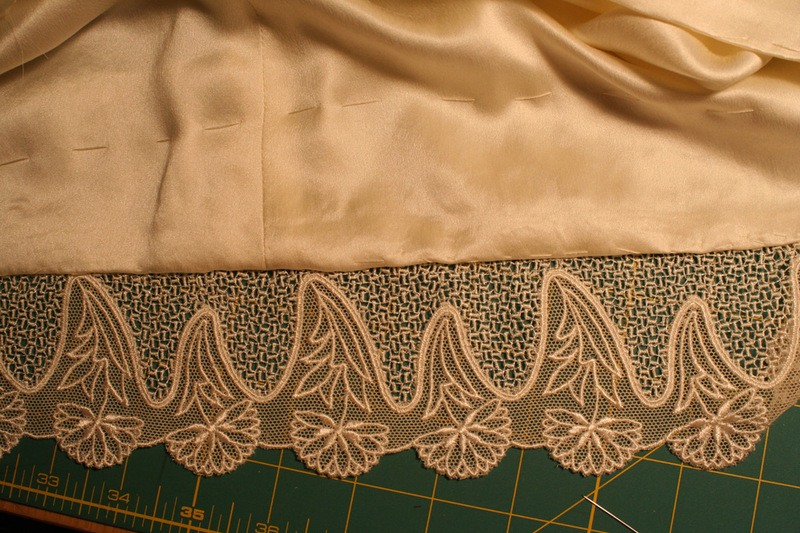 It’s the perfect length.Â There is just enough lining to sew a 1/2″, twice-doubled-over hem and still be able to mount the lace at a height that will hide the stitching in the hem. I’ve been reading avidly through the book on design that I got a few days ago.Â I never realized how much line and shape alter the “feel” of a piece!Â it had never occurred to me that horizontal lines are calming and diagonal lines energetic, but now that it’s been pointed out to me, I see that it’s true!Â So interesting to read.Â I’m looking forward to applying this in my designs. I’ve also been thinking a little bit about what I want to try next in my designs.Â I think it will be abstract shapes (because I can’t draw/paint worth a damn right now), and will be experimenting with some of the design concepts I’ve been doing.Â I will definitely do some design exercises in purchased fabrics (sort of like sketching out a concept) before tackling a major project in handwovens. I can hardly wait to start! but I’ve got at least another week-and-a-half to go on the dress, first. Another book you might find helpful is “Drawing on the right side of the brain” Author’s name escapes me, but you should be able to find it by title.